An Indiana State University assistant librarian was named the winner of the Winifred Sewell Award at the Special Libraries Association‘s annual convention in Chicago. The BioMedical and Life Sciences Division (DBIO) selected Reference/Instruction librarian, Shelley Arvin, as the recipient of the award for “the innovative use of technology in promoting biological and medical information.” The DBIO is a 77-year old division with more than 550 subject specialist librarians in more than a dozen countries with an emphasis on the major life sciences. Arvin emerged as “a clear winner” from amongst the five, semi-finalists’ LibGuides. One of the main goals of LibGuides is to develop specialized, in-depth databases to aid students and researchers in acquiring the information they need on a subject matter in a particular field of study. The DBIO believed that Arvin’s work stood out as “it combined biologically – themed online games with solid scientific information.” They added that with such a design had the potential of attracting and retaining beginning college biologists. Arvin said some concepts in science can be very complicated to understand and it takes some time to learn and understand them while others can be tedious to students. By combining education material with a gaming environment, Arvin said it gives students the chance to learn these concepts in a fun way. In doing this Arvin added she aimed for education and fun as she researched and posted links to free online games. In her search Arvin researched and tested different games that incorporated science and fun. These games included following the evolution from a single celled organism to a complex organism to players simulating health professionals in diagnosis and treatment of patients in a hospital wing. “Good games kind of mirror those scientific principles but have a little bit of fun,” Arvin said. Arvin said she awaits the feedback from students to get an idea of how effective the database is, however, some professors are already giving positive feedback. “When they take time from their workload to contact me, I know they really liked it,” Arvin said. 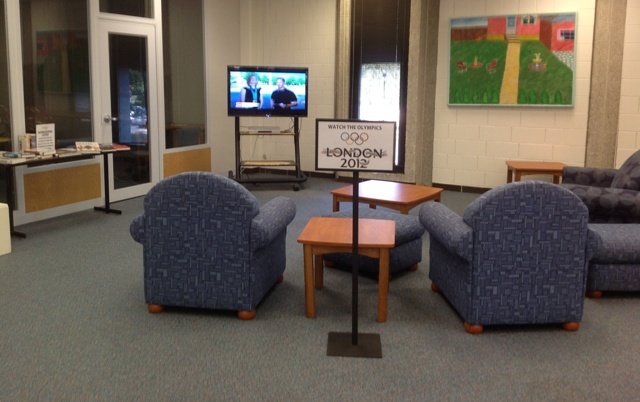 During regular library hours, drop by and find our large screen television tuned to the Olympics, near the Library Events Area. Bring your lunch or buy a snack in the Cup and Chaucer, relax and watch for a while. 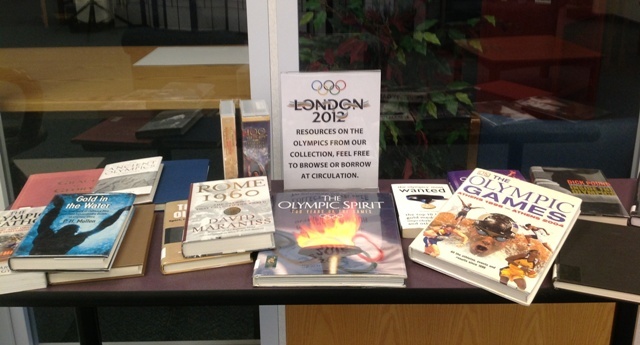 Library’s Books on Olympics: Browse while watching or Check One Out! For many the Civil War conjures up images of generals and soldiers marching onto battlefields with poised muskets, the dull roar of cannons, and the smell of gunpowder. However, Richard Schneriov and John Jentz paint a different view of the impact the Civil War had on our country’s history against the canvas of Chicago during the mid-nineteenth century. 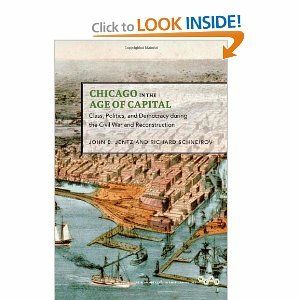 The book, “Chicago in the Age of Capital: Class ,Politics and Democracy during the Civil War and Reconstruction,” argues that civil war’s impact extended beyond that of military conquests in the South to social, political and democratic change in the North. Following the Civil War capitalism began to emerge as a dominant mode of production within the United States, Schneriov and Jentz argue. Second, the north underwent a revolutionary upheaval comparable to that of the one in the South, as newly formed social movements began to find their footing within U.S. politics. These movements had a profound impact on the nation’s democratic process. Third, within the U.S. class awareness began to emerge among the capitalist and labor classes and reshape politics. Research on the book began in 1986, two years after Schneriov received his Ph.D. at the Northern Illinois University. Schneriov said the authors placed the book on hold before picking it up again in 2004. Jentz and Schneriov worked together closely at the The Newberry Research Library in Chicago. The authors used data from old newspapers, raw census data and other published manuscripts and works at the time to compile a coherent story in support of their arguments. Schneirov has published three other books, edited three collections, and is a member of the editorial boards of three journals. In 1998, Schneriov’s book “Labor and Urban Politics: Class Conflict and the Origins of Modern Liberalism in Chicago, 1864-97” [AVAILABLE IN THE ISU LIBRARY AT F 548.42 .S35 1998] was awarded the Urban History Association’s prize for Best Book in North American Urban History. Schneirov has taught history at Indiana State University since 1989. A perfect way to spend an hour out of the hot, hot sun. Come into the Library’s Browsing area. 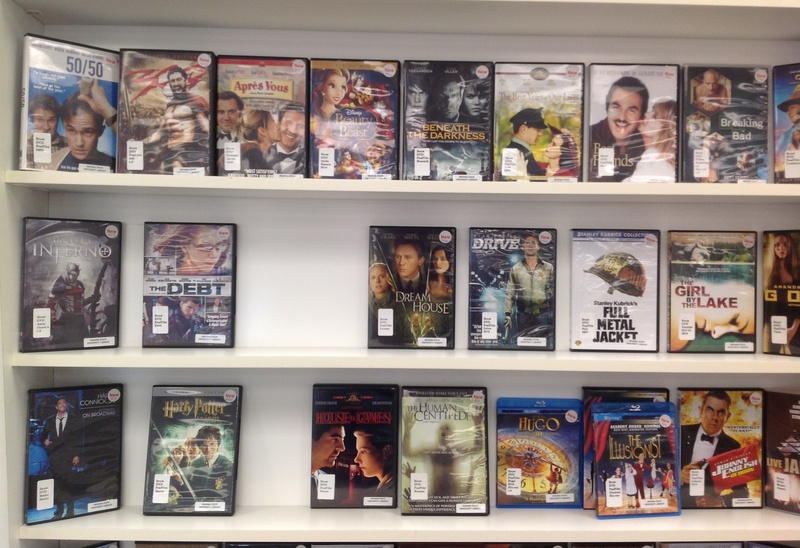 Don’t forget to check out the New Arrivals shelves when you come to the Library to get your DVDs [ISU students, faculty, staff]. Remember: ISU people can check out a total of 6 Browsing DVDs/CDs/Computer Games at one time for one week (no renewals). Open Access to research, scholarly articles, etc. is an ongoing ‘hot’ topic. At ISU, Sycamore Scholars is playing a vital role in the process. The movement to make research freely available got a high-profile boost this week with the news that Princeton University’s faculty has unanimously adopted an open-access policy. “The principle of open access is consistent with the fundamental purposes of scholarship,” said the faculty advisory committee that proposed the resolution. The decision puts the university in line with Harvard University, the Massachusetts Institute of Technology, and a growing number of other institutions with policies that encourage or require researchers to post open copies of their articles, usually in an institutional repository. Unpublished drafts, books, lecture notes, etc., are not included in the Princeton policy, which gives the university a “nonexclusive right” to make copies of its faculty’s scholarly journal articles publicly available. “Both the library and members of the faculty, principally in the sciences, have been thinking for some time that we would like to take a concrete step toward making the publications of our extraordinary faculty freely available to a much larger audience and not restricted to those who can afford to pay journal subscription fees,” said Karin Trainer, Princeton’s university librarian. She said they had encountered “no resistance at all” to the idea among faculty members. Authors may request a waiver for particular articles. Addressing fears that the waiver proviso would render the policy “completely toothless in practice,” the committee said that other universities’ experiences showed that journal publishers will often adjust their contracts when an author’s university has an open-access policy. Ms. Trainer said that the policy does not suggest any penalties for authors who do not comply with it. Princeton already has a public data-storage archive, DataSpace, but there’s not a lot of material in it yet. The faculty committee said it thought DSpace could be adapted to serve the open-access mandate. “We are still sorting out our options here,” Ms. Trainer said. Open-access advocates welcomed Princeton’s decision. 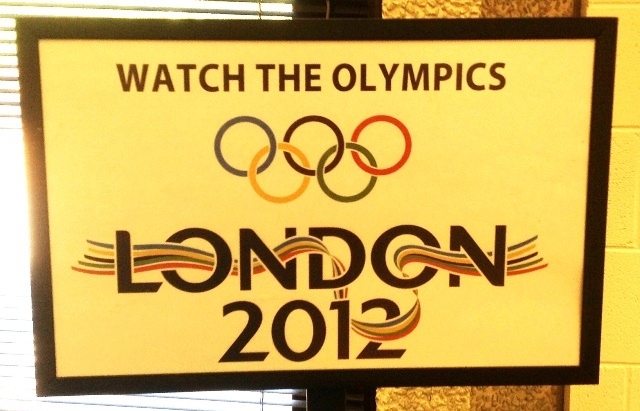 Lorraine Haricombe, the university librarian at the University of Kansas, said she was delighted by the news. She helped put together the Coalition of Open Access Policy Institutions, or Coapi, to share experiences and open-access strategies. She said the group would invite Princeton to join its discussions. “This shows strong support for what universities do, and that is share their scholarship for the support of the cause and as a public good,” Ms. Haricombe said. The new date is Wednesday, September 12. The plan is the same: drop in to learn about new resources and services that the Library has to offer. Get your card stamped for prizes. Eat some pizza & popcorn. Listen to the DJ/band outside the Library entrance! Join 5,000 of your closest friends for the biggest new semester kick-off around! The Vigo County Public Library continues working toward a massive renovation of its downtown branch that will include new security and an automated checkout system. The library board chose Monday night to further investigate bids it received from several vendors seeking to install new floor covering, new surveillance cameras and do other work toward the renovations. Wide differences in some of the bid prices led the board to suspect some of the bids may have included additional work or been incomplete. Renovations at the downtown branch will include new floor covering in the lobby, meeting rooms and computer lab. The renovations will also include demolition of an interior wall, installing security cameras and a paging system. 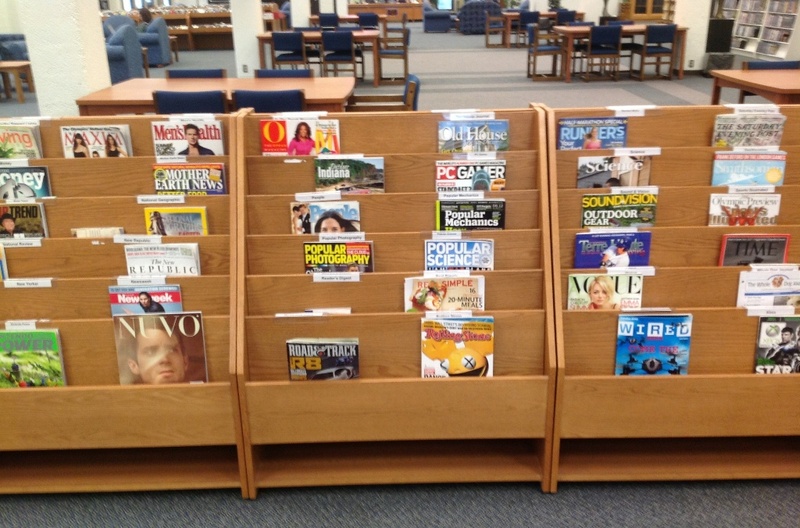 The cost for that work is expected to be around $200,000, said Nancy Dowell, library director. If all goes according to plan, the library should be ready to launch its new, automated charging and returning system before the end of this year. 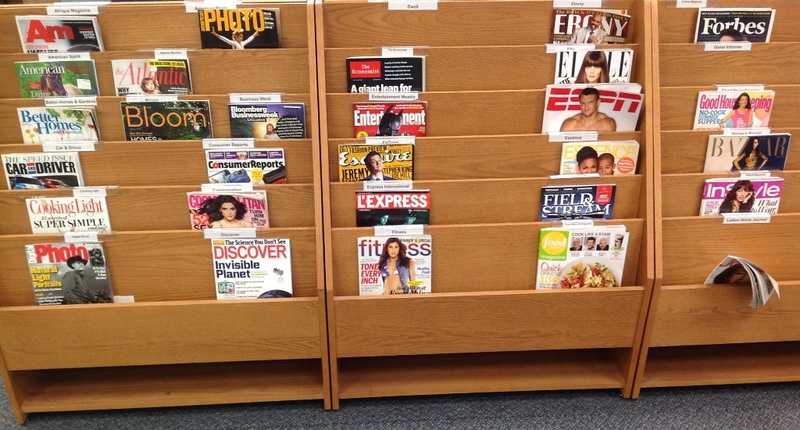 The system will allow patrons to check out and return materials without the help of a librarian. It will also include improved security, including new anti-theft gates at the public exits and entrances to the building. The board voted in January to order the new equipment from 3M Library Systems of St. Paul, Minn., at a cost of $187,000. • Meanwhile, the library board voted Monday night to purchase scrolling electronic signs to be placed on the face of the two existing signs outside the library – one at the Poplar Street entrance and the other at Seventh and Walnut streets. The digital signs, which will be in color, will announce library events, hours and other information and will cost about $25,900, Dowell said. • Also Monday, Dowell announced that the Wiley High School Class of 1962, under the leadership of Frank Volkers, has raised more than $3,000 to maintain the former high school’s cupola, which is located on South Seventh Street near the library’s Walnut Street entrance. Wiley High School, which closed in 1971, was located where the library stands today, and the cupola remains a reminder of the former school. Reporter Arthur Foulkes can be reached at (812) 231-4232 or arthur.foulkes@tribstar.com. The Vigo County Public Library has upgraded its telephone system to better serve library patrons by moving to a direct dialing system. Patrons can now call a library department directly without having to go through an automated attendant or a switchboard operator. The Vigo County Public Library’s primary number, which directs callers to an automated attendant, will remain the same at 232-1113. For a complete list of the new direct dial numbers, please visit the Library website at www.vigo.lib.in.us or call the Community Services Department at 232.1116.